The high stakes, turn-based tactical shooter XCOM 2 is now free on Steam, and will be until March 25. If you strategically fighting back against an alien menace floats your boat, then you can also get up to 75% off XCOM 2 and various DLC packs if you fancy investing. The potential savings get slightly complicated, so strap in. The base game is reduced by the full 75%, which makes it $11.40/£8.74. If you feel like diving deeper, then the XCOM 2 Collection is reduced by 68% – that’s $40.24/£30.84. The pack includes the base game, the War of the Chosen expansion and four DLC packs – if you want them on their own, then each has 50% off on Steam. Phew, still with us? Good. 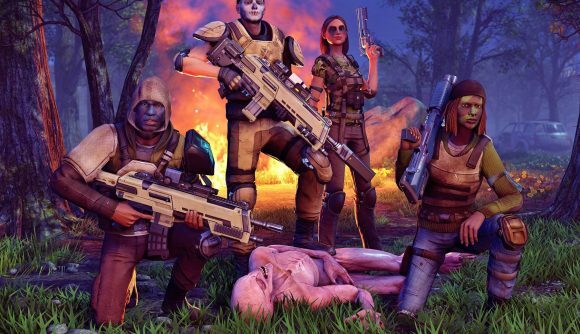 The game see’s XCOM’s forces scattered by an alien race, and it’s up to you to get the gang back together again. As our XCOM 2 review from way back when PCGN was still broadcast in black and white confirms, we rather liked it. Unfortunately, the Tactical Legacy pack isn’t included in the sale, but there’s still plenty to get your alien-murdering mitts on. We particularly enjoyed War of the Chosen, so highly recommend you check that one out. That’s your weekend sorted, then. You don’t need to thank us, you’re more than welcome – it’s just what we do.